When I think about a nurse who embodies the qualities and characteristics that define “Nurse of the Year,” there is only one name that comes to mind. As a nurse for over forty years, thirty of which have been in WOC nursing, her specific contributions are too numerous to limit to three pages. But, to name a few, she has excelled in acute care, home health, and in an academic medical and Magnet nursing facility. She is considered an expert in these fields and is heavily relied upon by others to provide unparalleled patient care. With regard to acute care, in 2011-2012, she developed, from the ground up, an outpatient Ostomy Clinic, which filled a serious gap in the community. Sue Creehan became a CWON in 1987. In1998, she began working at VCU Health System . After 4 years she served as the nursing director for the out-patient wound center and as a clinical research coordinator for Phase 3 and 4 wound healing clinical trials. In 2002 she accepted her current position of Wound/Ostomy Program Team Manager for VCU Health System. As the manager, she was successful in growing the inpatient WOC team from 3 to 9 employees. She utilizes the servant-leadership model to support, develop, and advocate for her WOC team. Over 12 nurses have pursued WOC certification under her mentorship. One of Sue’s major achievements was the development of the unit based skin champion model for pressure injury prevention. Leading the way for success, these staff nurses have provided peer to peer influence on all 41 inpatient units, reducing the hospital- acquired PI prevalence rate from 6.9% (2008) to 0.7% (Aug 2017). She developed an educational “bootcamp” for the champions and the group currently has 86 members. The monthly meetings consist of data analysis, journal club, educational series, lessons learned and concludes with 5 take-away messages. In 2016 she introduced the WTA program to her organization and has been the program coordinator with 4 cohorts of students completing the program to date. She has been responsible for developing a biennial and now annual 2-day educational event called Stepping Stones to Excellence in Wound Care. This was born out of a vision to extend knowledge and expertise beyond the walls of her organization and assist nurses and care givers from the region to improve care. , In addition to this program she and another co-worker had a vision for creating a larger event; a summit. With the support of VCU administration and in collaboration with ANCC Magnet organization and the University of Nebraska, Sue was the co-leader of a pressure ulcer summit in 2014 which brought together 55 key stakeholders and experts from around the country (CMS, WOCN Society, AAWC, Magnet, NPUAP, researchers, educators, and clinicians).This 2-day summit tackled developing a framework for a comprehensive pressure ulcer prevention program, developing an adjusted risk assessment tool, and clarifying terminology related to skin changes at life’s end. The results of the summit were published in the JWOCN. Sue organized the first meeting of WOC nurses in Central Virginia in 1999 and in 2000 Central Virginia affiliate was born! She served as the president for the first 4 years and again from 2015- present. She has also served on the MAR board as president elect, president, and membership chair. 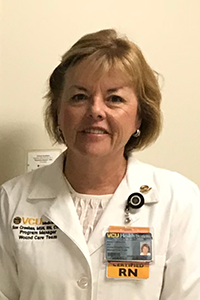 She was a founding member of VPURT (Virginia Pressure Ulcer Resource Team), a multi-disciplinary team supported by Virginia Health Care Association. She currently serves as a consultant for Health Quality Innovators, the quality improvement organization for CMS in the state of Virginia. Sue was recently invited by the Swedish government to be 1 of 3 speakers at a gathering of all 25 of Sweden’s directors of health and chief nursing officers at a symposium in Stockholm, as Sweden is just beginning their journey in pressure ulcer prevention. In May 2017, she was asked to speak at EWMA (European Wound Management Association) in Amsterdam on developing a comprehensive pressure injury program. In 2017, Sue was an invited lecturer for the 3 big national meetings: NPUAP, SAWC, and WOCN, which she considers to be the biggest honor of her career!